Young, tender bite-size potatoes. Marble potatoes need very little prep, just boil, blanch or fry whole. They are sweet with a buttery flesh and thin skin. These small potatoes lend themselves well to alternative potato preparations, not ideal for making mashed potatoes, but excellent as a confit (cooked in duck fat), blanched, smashed and fried in butter with garlic and herbs or steamed and served with butter and parsley. Marble potatoes are any variety of young, tender potatoes. 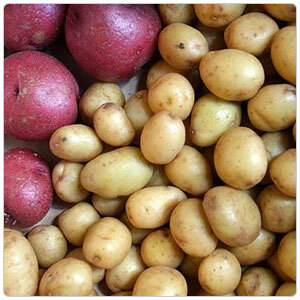 They are generally smaller and picked sooner than new potatoes.